This game is a age old classic,not only is it the first snes game it also brings new things to a already blossoming franchise. Like it's predecessors you have to save princess peach from Bowser's clutches. Your Adventure begins on the quaint and peaceful island called Dinosaur island. 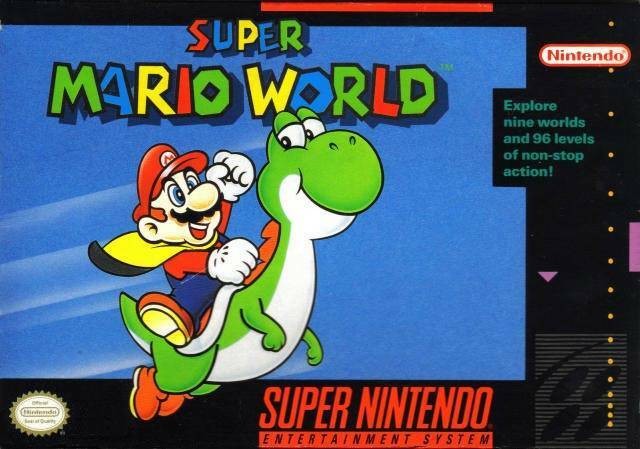 The Storyline is alot like super mario bros. 3 you have a map where you traverse, but one of the main differences is that you have a Greenish like dino called a Yoshi to help you. It's attack's are jumping and if it eats a certain fruit breathing fire balls. Another big change to the game is the addition of the koopa kids, they are bowser's kids in this game and they guard each of the castle's. As like any mario game there is enemies like koopa troopa's and goomba's. In order to rescue princesses peach you must traverse 8 worlds each stronger then the last, till you reach the castle at world 8. That is where you fight the self-declared king himself Bowser. Once you beat bowser the princess is rescued and gives you(mario) a kiss on the cheek. The item's in the game were mostly unique like the dragon coins and Yoshi wings. The p-balloon witch was in super mario bros 3 was a nice addition. All in all this game at the time was a masterpiece, it had alot of changes to it witch made this game even more desirable but alas even a great game has problems like the lack of new power up's and glitches with the game. The storyline is well though-out and the character's were given updated looks. For a mario game made in the 90's it is still one off my favorites. Nice review of the game I am basically Let's Playing. Yeah you should get it its fantastic!